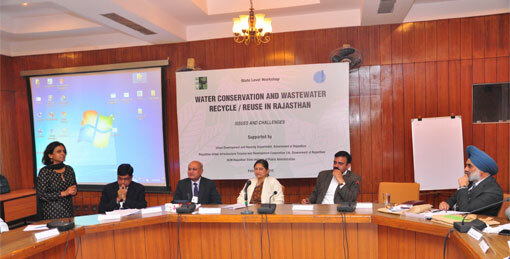 Jaipur, February 7, 2013: CSE organised a state level workshop on “Water conservation and wastewater recycle/ reuse in Rajasthan - Issues and Challenges” on February 7. The workshop was supported by the Department of Urban Development, Rajasthan Urban Structure Finance and Development Corporation (RUIFDCO) and HMC Rajasthan Institute of Public Administration (RIPA), Government of Rajasthan as local partner and host. The workshop is part of various activities supported under the Comprehensive Capacity Building Programme (CCBP) – National Urban Renewal Mission, Ministry of Urban Development and Government of India. Rajasthan is one of the participating beneficiary states under Central Government’s NURM programme. The mission cities in the state need to expand the water supply and wastewater management infrastructure. But the opportunities under NURM also come with a challenge to ensure sustainable water management in a state known for its scanty rainfall with history of prudent use of available water resources. Urbanisation in Rajasthan will reach its peak in 2025. Rajasthan Housing and Habitat Policy (2006), Rajasthan population of every district is likely to be urbanised 2025. Between 2001 and 2011, the number of class I cities in Rajasthan increased from 20 to 32. Rasthan State Action Plan on Climate Change (2011) says that the state has the highest probability of drought occurrence in the country. In absence of adequate surface water sources, there is over reliance on ground water. The groundwater in the mission cities is under threat.According to CSE’s finding (Seventh Citizens’ Report called Excreta Matters), there is no official plan for sewage in the state. The report says that waterbodies which are bigger recharge bodies in urban areas are receptacle of sewage. To generate awareness about the best management practices (BMPs), state of art knowledge and reforms in the area of urban water conservation including wastewater reuse/recycle. To discuss with key stakeholders the concept, issues/barriers and experiences in mainstreaming of the reforms. To explore capacity building support required to implement projects aimed at mainstreaming urban water and environmental sustainability related reforms in the NURM schemes. More than 90 participants from different corners of the state were present. The participants included government officials, researchers, NGOs, academicians, medical practitioners, students from Rajasthan as well as different parts of the country. There were experts from Indian Institute of Technology (IIT), Mumbai, National Environmental Engineering Research Institute (NEERI) and Central Public Health & Environmental Engineering Organisation (CPHEEO). CSE researchers also shared their experiences on the issues. The workshop concluded with the idea that there was a need of capacity building programmes to promote decentralised water-waste management systems and CSE definitely needs to get involved in the state programmes and train the government officials on the tools, techniques and policies on decentralised techniques of water management related to reforms of JNNURM. For more details, please get in touch with Sushmita Sengupta (sushmita@cseindia.org). You can contact her at 09899928837.